ABOUT THIS BLOG: WHERE CURRENT EVENTS THROUGH BIBLICAL LENS; SOLID BIBLE TEACHING AND FUN-FAITH-FELLOWSHIP RESIDE, THROUGH JESUS CHRIST. THE 3:16 VERSES OF THE BIBLE, PART 20: "A DIRE WARNING"
A survey by the American Culture and Faith institute (as well as Barna and a host of others) are devastating for the church, its leadership and its people. This wide ranging survey (here) found that 27% of Christians (and by that we mean those who profess to be born-again, conservative believers - the only Biblically sound definition) believe it is NOT their responsibility to share their faith with non-believers! This is on top of incredible numbers where all the major research organizations - from George Barna to the Pew Research Foundation for Religion, have found that only 9% of adult Christians even have a Biblical worldview. In a country of roughly 330 million people, 9% represents a really small amount of people, given the adult population. The 2013 US Census says we have just over 242 million adults in the USA, with the total now close to 250 million over the age of 18. When calculated and filtered right down, by 2017-18 figures, less than 23 million adults actually have true Bible-based faith, which is what a Biblical Worldview means. - The inerrancy and accuracy of the Bible as God's Infallible Word. The proof is the document itself: 66 books written by over 40 authors, over 1500 years. These books were written by men, most of whom lived at different time periods and never knew each other. Yet, they tell the same story - the story of God's Redemption plan through the Messiah - the Lord Jesus Christ. - Absolute Truth. A biblical worldview believes there is such a things a moral clarity. There are no shades of grey when it comes to the Law of God. He has laid out in the Ten Commandments what is NOT acceptable. They stand today, even in courts of law worldwide. - Jesus Christ is the Son of God. God cannot do only one thing - He cannot sin. A biblical worldview believes this fact because only Someone sinless can pay for the sins of an entire human race. - Because God sent God the Son to redeem the world, He remains in charge and completely involved in the affairs of humankind, as the All-powerful, All-knowing, and omni-present Creator of the Universe. - A Biblical worldview knows that Satan is real and is the prince and the power of the air, in this current age. Satan has succeeded in lying to most of humanity, that he does not exist, so they can live as they wish, with no consequences. This is not a worldview from God. - A Biblical worldview means the acceptance of the literal word of God as pure and divinely inspired in all its teachings. - A Biblical worldview means that there is only ONE way to Heaven and it is through the Lord Jesus Christ, as Savior and Master of all. The world's view is that there are many ways, Christianity is only one of the ways, and we are intolerant if we believe otherwise. Jesus said that He is the Way, the Truth and the Life and that "no one....(meaning NO ONE) comes to the Father (goes to Heaven) except through Him" (from John 14:6). Christians have the advantage which the majority does not and this advantage confirms the validity of John 14:6. This confirmation is the Holy Spirit. Only born-again believers, who have a Biblical worldview, have been forgiven by God and have accepted Jesus Christ as Lord and Savior actually possess the Holy Spirit embedded in our souls, as our confirmed reservation in Heaven - for lack of a clearer description. - Finally, a Biblical Worldview means that is the responsibility of each Christian to share our faith, in thought, word and deed. Never mind the violation of all of the above, but this last one is the biggest shortcoming of the modern church, church leadership and the Body of Christ. 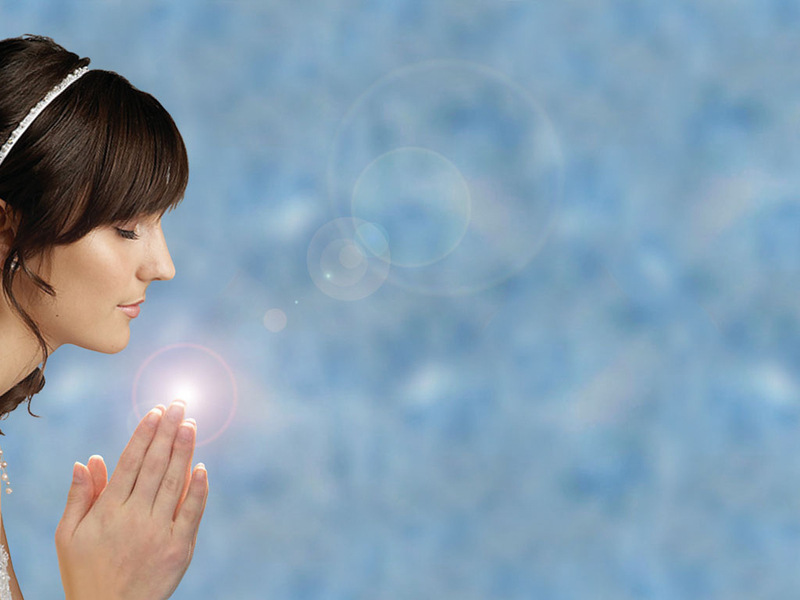 We are not talking about the 91% of adults who accept the modern "new spirituality" as their "belief" system. They have taken a cafeteria approach to "faith" and mixed in eastern mysticism, buddhism and a little of this or that and a dash of "feel-goodism" and come up with a pseudo-Balaamism. What all modern trends, from actual scientific research by George Barna to evidence on the ground, in front of our eyes, show us is that most Christians think it is the pastor's job to reach people for Christ! The question is, how can a pastor or preacher who runs the church, reach the co-worker or neighbor or the cashier at your favorite diner etc...when you and I are the only ones who see them regularly and can approach them with ease? The answer lies in the fact that it is NOT the pastor's job to love our co-workers and neighbors to Jesus, but ours. His job is to equip and show the congregation HOW to reach the lost and then we execute that plan over the next six days. We know that this is not how it turns out, because, even in the best of churches, most attendees are barely tuned in and leave with just enough to get them through the next week. It is difficult for someone like this too share Faith. It is not impossible at all, just difficult. Verse 17: God has appointed His servant as a watchman....not in the military sense but in the Spiritual sense of the word. Ezekiel's job was to warn wayward Israel. Our job as watchmen today (Jesus said to be on the alert and watch), is to read the sign of the times. Our job is to find the lost and reach out to them. Our job is to warn them of the Wrath that is to come and how to prepare for it. Verses 18 and 19: This is scary for the believer. There are warning signs everywhere that the end is coming closer. Yet, Christians. the church and most western believers are joining the party, caught up in trivial pursuits and living in the fast lane with no thought to eternity - just like the lost. They have absolutely no concern for the Lost or even believe like them that "everything will turn out good in the end". A former member of a very popular megachurch once told me that an associate pastor there told him that the majority of the thousands who go there each and every Sunday are not there for the things "you and I think about" (evangelism, outreach, discipleship or repentance)...."they are here to get something for themselves to either get them through the week, knowing they've been to church....or just that - to be at church and meet their friends and drink fancy coffee"! That is NOT what God expects of those whom He said by His Blood on the Cross. Check this - suppose your neighbor's roof suddenly looked like there was some smoke, then you notice a thin orange flame. You know he works second shift at the plant and is sleeping at 8 am this Saturday morning after his shift. Suddenly the thin flame kicks up with the wind and the roof over the bedrooms is on fire. Your neighbor is sound asleep from a tough night shift. Do you just keep him and his family in your "thoughts and prayers" and HOPE the fire department gets there soon? Do you actually call the First Responders and wait? OR do you do go bang on your neighbors bedroom window to alert him and his family to get out quickly? The last one is what God expects us to do FIRST, while calling for help, believe it or not. We obviously had time to see the warning signs of a fire. What is stopping us from running and banging on the neighbor's window to wake him up and get him out of there? This is exactly what God told Ezekiel to do to even the enemies of God - warn them about the coming judgment. If Ezekiel warns them and the wicked refuse to repent and turn to God, then Ezekiel is in the clear. He did his job. If we were continue to tell people about God or even invite them to a Christian event (or church) where they could hear the Gospel and be on the road to salvation, and they do respond, our work will be rewarded on great and terrible Day of the Lord. However, if the Lord, through the Holy Spirit, directs us to speak to someone or give them a free lunch or a gospel tract or even tell them a great God bless you in the long line at the Grocery Store, and we refuse because "this is NOT our job, but the preacher". Then this person will suffer huge loss on Judgment Day. The Apostle Paul says this person will be saved only, with no reward. In fact, God has said that (in Verse 18 above) He will hold us accountable. Do we really wish to take this chance and only slide into Home Plate? Don't we want to head up standing up with all arms high in the air, in a sign of victory and praise? This can be easily remedied - simply go against the prevailing lazy Christian mindset and do as Charles Spurgeon, the Prince of Preachers once said. Spurgeon once said, "gentlemen, do something....DO SOMETHING"! That something is to have a Biblical Worldview - and do what that means. Luke 17:11-19 11 Now on his way to Jerusalem, Jesus traveled along the border between Samaria and Galilee. 12 As he was going into a village, ten men who had leprosy met him. They stood at a distance 13 and called out in a loud voice, "Jesus, Master, have pity on us!" 14 When he saw them, he said, "Go, show yourselves to the priests." And as they went, they were cleansed. 15 One of them, when he saw he was healed, came back, praising God in a loud voice. 16 He threw himself at Jesus' feet and thanked him-and he was a Samaritan. 17 Jesus asked, "Were not all ten cleansed? Where are the other nine? 18 Has no one returned to give praise to God except this foreigner?" 19 Then he said to him, "Rise and go; your faith has made you well." There is a very serious account of an incident, recorded in the Book of Luke, where Jesus responded to ten lepers calling out loudly to Him for mercy, pity and compassion. They were far enough from the general population, as required by Law, since leprosy was a deadly contagious disease. - Go (from the Galilee area) to show themselves to the priests in one of the nearby synagogues (according to Jewish Law....in the Old Testament). - As they were walking away, He healed them and cleansed them of Leprosy. - One of ten lepers, stopped and came back to Jesus. - He was a Samaritan and could not enter the Jewish Synagogue, as he was considered a "foreigner". - He was the only one to thank the Lord Jesus for healing him. But he was not only grateful. He recognized his position in life, not just as a leper outside the fold, but as a stranger/outcast/foreigner etc. who deserved nothing but got everything. - Were not 10 lepers healed? How come only 1 out of 10 returned to properly say thank you? - I came to give the message of Salvation to the Jews first, but only this outsider responded to it. - Therefore, I will save whom I will save. When Jesus said to the Samaritan who came back to thank Him for healing, that his faith has made you well, the word Jesus used for "made you well" is stunning. The word is "SOZO" - the word for Salvation. Jesus said to this outsider "your faith in Me has saved you!!" - Jesus saved this one man. The others were healed in the natural. This Samaritan was healed in the soul as well. I have known people who were healed from different diseases, including cancer, who were just like the other 9 of the 10 lepers - completely ignore God and go about their lives as if nothing happened. The miracle of beating cancer, for instance, well, "I was owed that". - We are all diseased by sin. But there is a Savior Who can cleanse us from all unrighteousness. His Name is Jesus. - When we call out to Him, He usually answers. - There is one qualifier. That is, we MUST recognize Who He is. He is God. - Faith has legs. Jesus did not tell the ten men they were healed. He said "GO SHOW YOURSELVES" to the priests. Under Jewish Law, only the priests could certify that a Jew was healthy and eligible to go back into the general population with a clean bill of health. They IMMEDIATELY recognized that fact of the Law and headed towards the temple in Galilee (where Peter and the other Galilee fishermen must have grown up). They all did have a certain measure of Faith to do that in the first place. - But there is a huge difference and here is where the new paradigm emerges. The Law said "only the priest can declare" the person physically well. But GRACE says only Jesus can make both body and soul well. The nine who ran to the temple to get the priests blessings completely missed it. In missing it, they blew past the forest for the trees just as most people today are missing life, because their noses are in their smartphones. They blow past it because their "Faith" is more new age-type "spirituality" where they think they can mix eastern mysticism, yoga and secular humanism and still call themselves Christian, because of the country of their birth or actual Christian ancestry. - The outcast Samaritan was just like all the others in that he was healed with the ten as he started walking with them to the temple, until he realized he would not be welcome there. - The realization of what was done for him, completely floored him to such an extent that he turn around (a picture of repentance) and ran to the Jesus Who called him by name for Healing! - He humbled himself by falling at the Feet of God. This is something too many Christians have trouble with these days. Humility is in rare supply, especially where so many people have a spiritual entitlement to the effect that "God owes them something". - He praised God. He recognized the Amazing Grace the saved a wretch like him. For that alone, he was so very full of gratitude. The lesson here for us is clear, given what was just written. We among most, have reason to be as humble, forgiven and worship- oriented. We have the Gospels and every variety of bible teaching ever known to man. This man had no such thing. All it takes is remembering what God has done for us. That He gave His son on the Cross for us that by this one act, we will be saved if we believe, humble ourselves to the point of Godly sorrow leading to repentance....which should lead us to worship. This is the essence of gratitude. In the Spirit of thanksgiving and for the Spirit of God to live in us, we must possess this and completely own it. A life of gratitude will help us keep everything in perspective. My life verse is Psalm 27:4, but after I got radically born again in 1988, the Lord gave me Psalm 118 as my life Passage. I only found out in 2017, that it was also one of the Bible Chapters which the Lord used to save the great Reformer Martin Luther! There is so much gratitude in Psalm 118 and others, that we should camp there daily and never move away from it. As we think about the gratitude of the former Samaritan leper and the kind of reaction us Christians should have, it is beneficial to see, and grasp, what Dr. John MacArthur, Pastor, Author and host of GRACE TO YOU has to say here"A thankful heart is one of the primary identifying characteristics of a believer. It stands in stark contrast to pride, selfishness, and worry. And it helps fortify the believer's trust in the Lord and reliance of His provision, even in the toughest times. No matter how choppy the seas become, a believer's heart is buoyed by constant praise and gratefulness to the Lord". Today (and each day), are we living our lives daily with such a bent? We most definitely should. Our "SOZO" (Salvation) requires it for the fullness of the Lord to work in and through us. This is a review of a paying customer to a local AMC Theater. It is totally unsolicited, just like all reviews posted on this site. Thank you. As mainstream Hollywood flounders under the weight of itself, the increasing abundance of some amazing Christian films is just astounding. Let There Be Light (LTBL) is one such film. While Pure Flix has become the "Warner Brothers" of Faith and Family big time movies and streaming services, LTBL is in independent movie produced by none other than the top U.S. Cable News Host - Sean Hannity of the Fox News Channel. "....But even with all the fame and success, Sol is empty and distraught on the inside and his increasing reliance on alcohol to numb the pain is only making things worse. His New York party lifestyle has isolated him from his ex wife Katy and their two remaining sons. Their unrelenting faith in God is something that Sol has actually grown to resent and he tells Katy that he just got sick and tired of her praying for his soul. Sol’s self-destructive habits eventually catch up to him and a serious car crash leaves him clinically dead for four minutes before he is finally resuscitated by some heroic first responders. It’s a miracle that he’s still alive, but what really changes Sol’s outlook on life is what happens during those four minutes. It’s a four word message that refuses to let him go despite his best efforts to deny it"...and those words are "LET THERE BE LIGHT". Right off the bat, as the movie swings open, a big debate is going on between a polished, apparently mainstream evangelical Christian TV show guy and the celebrity atheist and superstar author Dr. Sol Harkins, played by "Hercules" - Kevin Sorbo. The debate happens in front of a huge lecture crowd which is actually representative of a lot of professing "Christians" these days. While the evangelical debates from familiar talking points, the accomplished celebrity author is able to not just passionately proseltyze as a pagan to the weak minds out there, but then go Elmer Gantry on them, with raw emotion. You see, even atheists know there is a God. Just ask Richard Dawkins, who once remarked "Oh my God...." when he forgot the full title of the book "Origins of the Species" by Darwin! I have read other reviews of LTBL, by Biblical solid christian websites and blogs I always rely on for good discernment, and I could not disagree with them more. One of them is Patheos. This is NOT a cheesy Christian film. On the contrary, as anyone can see from the articles on this blog, I only promote the Bible and what it says - as far as life is concerned. I see the heresy out there and leave it to great people like Challies and Patheos or Dr. Al Mohler to talk about those things. My calling is to alert those who are open to it and what that scene, where the great Kevin Sorbo and his character shows is just how gullible and easily led into oblivion, the majority of people are. It was almost infuriating to watch our God being blasphemed by "Dr. Sol Harkins" (Sorbo) and people sit there and applaud him for doing so. These are some of the same people who will show up in a megachurch, the very next weekend and singalong with the latest Hillsong worship song, while sipping a caramel macchiato from the coffee shop in the church lobby. This is my first takeaway. 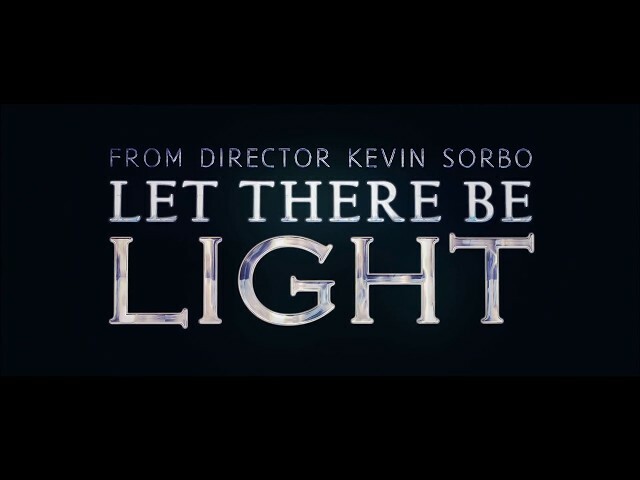 The movie DOES takes several turns from here on out as Sorbo's character embarks on a search for the meaning of those four words - LET THERE BE LIGHT. I see nothing hoaky or cheesy about it, just some good screenplay writing and as an evangelist and author myself - Gospel preaching. What some of our own evangelical critics of this movie may have forgotten is that the prime focus of a Christian and Faith-based movie is the Gospel. Using a former Italian 'wise guy' who spent 10 years in the joint and got saved when someone gives him a Gideon New Testament - his only companion for "three years in the hole" is genius. After all, the movie background is New York City and some of the best churches in NYC are in Brooklyn - the biggest being the Brooklyn Tabernacle, which covers every single nationality in the world. (Never mind the movie was filmed in Birmingham, Alabama! Lol). had their bibles - IN AMERICA! What Pastor "Vinny" does in his simple, funny and "goomba" - speak is to explain the Gospel of Salvation to an atheist better than some real preachers on TV and whom I know personally, who spent four years in seminary! He does that while having us laughing out loud. I have been a Gideon Bible Society man for going on 23 years and have handed out 1000's and 1000's of Bibles to so many people as well as tens of thousands of tracts. I have had one man come looking for me at a Christian men's conference years ago, who said I gave him a gospel tract in front of a bar, during a parade once, and he didn't want to take it, but his wife did. These things have eternal consequences. As one who is hands on involved in evangelism no matter the neighborhood (from college campus to the inner city), there is something happening when the Word of God changes hands from me to a recipient. 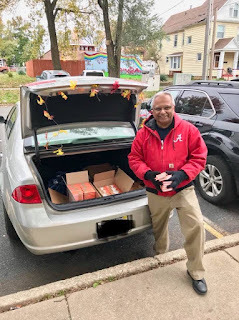 I just finished handing out 200 Orange New Testaments (student) to child and adult alike at an inner city "Trunk or Treat" Halloween replacement party for almost 400 people in a disadvantaged neighborhood. The hugs and love were icing on the cake. This was the second takeaway from LTBL - Pastor Vinny's Gideon bible from jail. Kevin Sorbo and wife Samantha with real life son. They all had a part in Let There Be Light. My final takeaway, which actually had me teary-eyed, was Dr. Harkins' wife Katy (who is actually Kevin Sorbo's real-life wife, Samantha) and her explanation to her two (also real-life) sons as to why God chooses to answer prayers the way He does. 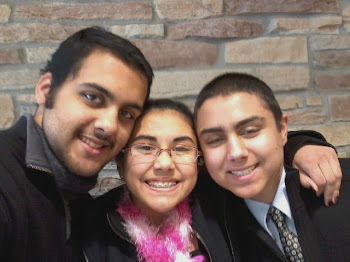 Her two surviving sons were praying for her healing from a terminal disease and worried God was not listening to them. THIS is the sort of thing which each one of us as Christians and believers will ultimately face in life, as sure as we live and breathe. If we cannot explain it to someone else, or understand it ourselves, then there will be bitterness, doubt and even unbelief. For me, this last portion of the Hannity-Sorbo creation was worth the entire endeavor - first, the risk of these great men taking a chance to make a movie like this and secondly, to have solid Bible based doctrine to apply to real life, and then write it into a screenplay like this. I think the misunderstanding of what a Christian movie, whether it is Let There Be Light or God's Not Dead (1 or 2) and some others is expectation. Sure we want to be entertained and have high standards due to the production quality of mainstream Hollywood. But a Christian movie is more than just watching Star Wars in IMAX and going "wow" for about 5-10 minutes afterwards. We expect something more life-enhancing, rich, solid and sound when we watch a Faith Based movie, whether is by Sorbo or David A.R. White or the Christiano Brothers. The good thing is - these men never disappoint and I for one, will continue to support these movies in the theaters. I have already started word of mouth among my own circle of friends of LBTL. Let's continue to do pass the word along, this holiday season! THE 3:16 VERSES OF THE BIBLE, PART 19: "THE GOD OF THIS CITY"
Several years ago, I met Aaron Boyd, the lead singer of the Irish pop band BLUETREE as they were doing an American tour. They had the best version of their original song "GOD OF THIS CITY" (sorry, Chris Tomlin) and it launched them all over the world. Bluetree had that mysterious and gentle, yet thumping, Irish sound which you hear in the music of U2 and the great Christian singer from Northern Ireland - Robin Mark (Days of Elijah etc.). In fact, Aaron told me that he was once Robin Mark's drummer. 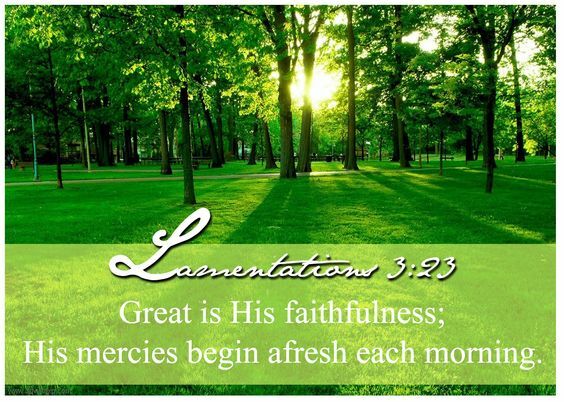 What does this have to do with Lamentations 3:16? There is no one like You God. The people of Jerusalem, God's own city, did not see that, acknowledge that or seem to believe it in their hearts, even while going to their temple (built by Solomon over 400 years earlier) to perform rituals before Him. They are no different than the people in the current city of Jerusalem or just about any city in the world today. But the God of the City sees. He sees the evil deeds of man and the dark hearts, souls and eyes of everyone who rather bow before an idol than live the simple life of the Believer. He sees and His patience will one day run out. In the days of Noah, He Himself said He regretted making man (in Genesis Chapter 6 and following). He flooded the earth and wiped everything out. He rebooted the earth and saved only those in Noah's Ark. Here thousands of years later, in 586 BC, He destroyed the spiritually filthy city of Jerusalem and the now corrupt temple and used the most brutal army on earth to do it. Less than 600 years later, in 70 AD, He would use the brutal Roman army again- headed up by General Titus, to completely destroy Jerusalem again. There is one more complete do over coming, but this is the last one, before the New Jerusalem descends from Heaven, completely built to divine blueprints and specs. This 586 BC destruction of Jerusalem was led by the prideful and power-mad king Nebuchadnezzar (who would later become a big Evangelist for Yahweh in Babylon while he was alive). The prophet Jeremiah who had warned and warned and warned kings and princes and priests and others about the coming Judgment, if they did not change their evil ways, witnessed this destruction in absolute horror. He knew what would happen if the people did not listen. It is one thing to know it, preach it and even suffer persecution for it, as Jeremiah did. It is a whole other thing to see the violent and precise Judgment of God right before one's eyes. After seeing the brutal Babylonians carry out what God had ordered on the object of His Wrath, the prophet wrote the Book of Lamentations. He wept and pour his heart on in this document, because there is nothing good about evil and just as bad, seeing destruction which follows it. Yet, even in this long song of Lament, Jeremiah saw the hope of the Lord. In this valley of despair and rubble, where he felt like the Lord, through the Babylonian army, had only left dirt and dust for the remnant left behind to eat (re: Lamentations 3:16), Jeremiah still saw the goodness of God, the God of This City. First of all, this poor man, who was chosen by God just barely out of his teens, to be His mouthpiece against the wickedness in the palaces and the Temple, was spared when Nebuchadnezzar sacked Jerusalem and killed all the royalty, except the king and took the elite of the nation into exile for 70 years. In fact, the Babylonians were made aware by God just who Jeremiah was and literally spared and left him behind to look after the poor remnant whom God wanted to stay behind and not go into exile. Jeremiah then wrote the Famous Letter to the Remnant in Jeremiah 29, which contains one of the most famous bible verses of all times - Jeremiah 29:11. It was a letter which gave hope to the people graciously left behind by God, that He had a plan to rebuild their lives, IF they would trust in Him. The second thing which Jeremiah saw, even in the lament of this book (Lamentations), when he felt that all that was in his mouth was gravel, dirt and bitter herbs, was God's Love. This is a lesson for all of us who now feel like Jeremiah did, as we go through trial, tribulations and worse. It is a lesson we should observe as true, when we also see our communities, counties and country destroyed by the same evil, sin and the sinful like Jeremiah saw when Yahweh destroyed HIS city in 586 BC. 19 Remember my affliction and my wandering, the wormwood and bitterness. Since He has laid it on him. Let him be filled with reproach. According to His abundant lovingkindness. THE 3:16 VERSES OF THE BIBLE, PART 18: "1000 YEARS IN JERUSALEM"
The old Gospel song has a great line “Every day with Jesus, is sweeter than the day before”. Every day with Jesus also brings us one day closer to the Return of the King and the Millennial Kingdom or the 1000 years Reign of Jesus Christ on earth. Yes, God Who became man and dwelt among us will be returning to the Creation He gave His life for, but not as the sweet baby born in a manger over 2000 years ago, but as He is. His Eyes will be full of fire and Judgment will be in His Hands. However, more importantly, He will be coming back – just as He promised. Most of the concepts and mind pictures we have of the Coming Millennial Reign of Christ, come directly from the Old Testament and the major prophets (Isaiah, Ezekiel, Daniel and others) are the chief proclaimers of the Truth of the Coming King, to a lost a perishing world. Jeremiah is one of those major prophets and his words from Chapter 3, directly from the Throne Room of God, predicting an event 2600 years ago, which is yet to come! Most casual Bible readers know a little of the coming 1000 year reign of the Son of God directly from the rebuilt new Jerusalem in the Holy Land, on Mount Zion. Whether they believe it or not, reflects on their level of biblical discernment. What humans believe really has no bearing on The Eternal God’s plans and purposes. What is going to happen, is going to happen. Scripture explains Scripture. The Bible is an unbroken thread written by over 40 authors, over a period of 1500 plus years, under the inspiration of God. Most of these men never knew each other, yet the Bible has one theme, one narrative and one account with many sidebars of the same One God and His Son, Jesus Christ. We all know the King was born in a cold dark stable in Bethlehem to a poor couple, lived thirty three years, ministered and taught for three and then gave His life as a ransom for all the world (John 3:16). This is the actual visual evidence of an event which is coming so fast, you can feel the winds of change blowing. Verse 14 above describes the "armies in Heaven in fine white shiny linen". Expect the following Bible heroes to be riding in the Celestial Cavalry: King David, Uriah the Hittite, Joshua (God’s General), Benaiah among many other recognizable names! This is the final battle scene of ALL HISTORY! Let this soak in for a minute, then let us return to our original text: Jeremiah 3:16. - Old things are passed away. We don’t need relics which have long since served its appointed purposes Just as God says in the verse that Israel did not need the Ark of the Covenant again, there is also no need for communion, church buildings, church staff, Christian TV or this very blog you’re reading! Why? Because Jesus is Lord and is live and alive in person in the same air as we are breathing in our supernatural bodies, and the paradigm has shifted. We are now in the Kingdom we were preaching about during the Church age, and those particular books are closed. - Jerusalem will be the Capitol of the Kingdom. Jesus’ Throne will be there and there will be no question about it. There will be no temple mount problems….no conflict over which “religion” owns which spot on the Hill where God’s Temple sits. 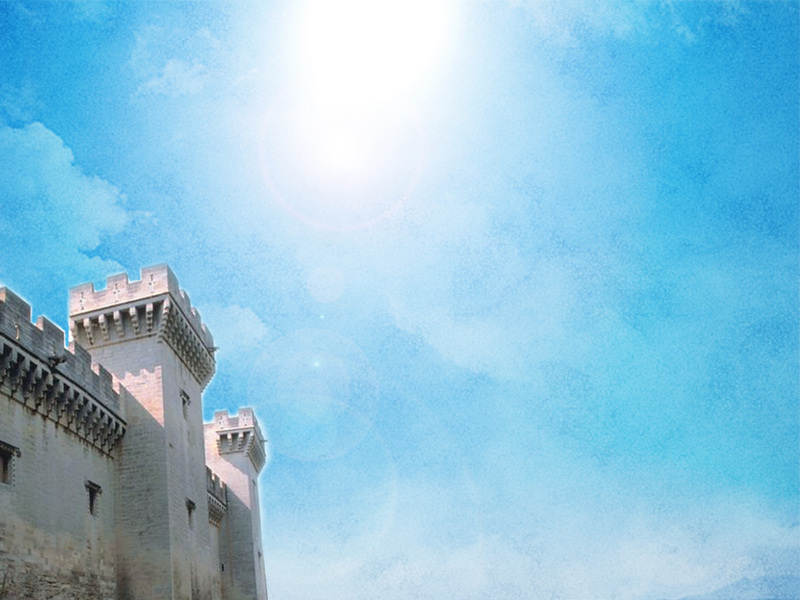 The new golden Jerusalem will not put up with any…and that means absolutely NONE of the garbage you see today. There will be one Faith only – Jesus and Jesus alone. Everything else will have gone up in smoke. - All nations will be recognize just WHO is sitting on the Throne Jerusalem and all eyes will always be on Israel. Zechariah tells us that believe it or not, there will be rebels who will refuse to go up and honor Jesus each year at the Feast of the Tabernacles as required. How, you ask, can this still happen? Well, even in the Millennial kingdom, babies will be born in our local hospitals who will not have Faith yet, and grow up to be against God Himself, even though He is right here on earth! They will be dealt with as rain will be withheld which will adversely affect their crops and food supply. At the Final Judgment (Revelation )Jesus will complete the transition of His people into the Heavenly realm, while all rebels will be cast into a fate they will regret forever – the Lake of Fire. The facts are this – first of all, Jesus is set to return and each day is one day closer. 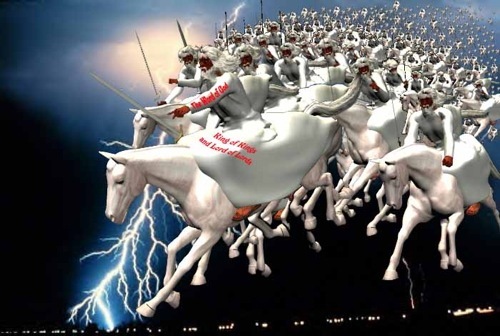 Secondly, if anyone reading this is on the ground of planet Earth when the eastern sky cuts open and the White Horse leaves Heaven with an army of Bible heroes in white fighting gear, it is going to be too late. Thirdly, in light of this and knowing this is going to happen, regardless of what any human believes, don’t you think it is encumbent upon each soul to make 100% sure that they are right with God, and Jesus is the Lord and Master of their lives? There is no mulligan and no middle way. It is Jesus plus Nothing. It is Jesus MINUS nothing. It is all Jesus or you are eternally lost and in huge danger should you be sitting watching Netflix and eating pizza and drinking beer, when the Lord puts a stop EVERYTHING on earth. Do not incorrectly assume "everything will work out in the end". Everything WILL work out in the End, as God planned it in general. For the soul who has lived an unforgiven, rebellious life with these incorrect assumptions - big trouble ahead. DO NOT LEAVE THIS TO CHANCE!. THE 3:16 VERSES OF THE BIBLE, PART 17: "CHRISTIAN LIVING IN A CORRUPT WORLD"
16 Moreover, the Lord said, “Because the daughters of Zion are proud and walk with heads held high and seductive eyes, and go along with mincing steps and tinkle the bangles on their feet. 17 Therefore the Lord will afflict the scalp of the daughters of Zion with scabs, and the Lord will make their foreheads bare.” (Isaiah 3:16-17). There really is nothing new under the sun. The decadent unsavory lifestyle in a "Keeping up with the Kardashians" celebrity culture may be amplified because of today's 24/7/365 second by second LIVE action existence. It may even be more outrageous than anything ever seen. However the seeds of this self-destructive conduct existed 4000, 3000 years ago, 2000 years ago and if the Lord tarries, will increase in outrageous depths of decadence 50 years from now. The conditions which led the Lord to declare complete judgment on EVERY single aspect of human urban life across Judah (where the great city of Jerusalem was/is) are also not dissimilar to modern times. The pagan idolatry, and its subsequent sexual immorality, the pride and lack of any discernment were as present then as it is now. Most of what happens today, in some of the vilest corners of worldwide social media, has its roots in the Tower of Babel. It was here that a famous descendant of Noah - a man named Nimrod, constructed one of the first pagan temple with its immoral conduct right in the open skies. This was a major reason for the Lord to scatter the people, create all the languages we have today and deal harshly with the pride of man. From this verse, we see that God despises the Proud. Throughout Scripture, and thus in our own lives, we know that He gives grace to the Humble. Today, the self-absorbed, selfish culture tells us that "it is all about us". It is all about how we look, how we feel, and how we deserve the best - no matter the cost. There is a huge cost to this creation of coastal advertising agencies, Hollywood and New York board rooms and its associated forms of electronic and print media. Never before have entire industries sprung up to bring back the lost fountain of youth. People inject botox and other temporary additives, designed to make people look good, into parts of their bodies where it has no business being. Botox is a bacterial toxin. Yes, it is as unhealthy as it sounds. People will go to all kinds of extremes to as God says hold "their heads high...and seductive eyes", with their costly designer clothing and jewelry etc. They must have the latest and best smartphones and other electronic gadgetry which is about as valuable as the passing wind, until the next update. While all this is going on...while they expose their private lives (and bodies) to gain fame, popularity and millions of followers on the various social media, their hearts are as dark as their empty souls. They have no concept of the judgment and accountability that is to come. Even worse, they do not seem to care and in fact, mock those who live by the Code of Christ. But it is not just the rich and famous, but those whom they influence among the general population. These are the regular folks who take some of this stuff and ruin their lives, until the Lord also brings the hammer down on them, as He says here in Isaiah 3 verse 17. These are the ones who will say to themselves "hey, I am not as bad as so and so....or if they can do it, so can I!" 1. Make the main thing, the main thing. We were not put here on this planet, for however long God allows us, so we can long for "likes" on Facebook and Instagram, but that our lives should be a pleasing one to our Creator. That can only happen when we come to the realization that we were created for good works, which can only be meaningful if we are forgiven sons and daughters of Yahweh - the Holy One of Israel. We must believe the Gospel, turn from our sin and believe that Jesus is Lord. 13 ... live in peace with one another. 14 We urge you, brethren, admonish the unruly, encourage the fainthearted, help the weak, be patient with everyone. 15 See that no one repays another with evil for evil, but always seek after that which is good for one another and for all people. 18 in everything give thanks; for this is God’s will for you in Christ Jesus. 20 do not despise prophetic utterances. The first I ever heard of David A.R. White, was from watching a series of movies I had bought at the now defunct Family Christian Bookstores, over a decade ago. Second Glance (1992) showed a young David, who himself was not too long out of high school, in what was the first of a multitude of independent Christian films which are assuming higher prominence, in these last days. It was not his first movie, but the first one which led me on a journey to build a library of these early movies produced by transplanted New Yorker Rich Christiano, his brother Dave and starring David A.R. White. I have spoken with Rich several times over the years, in the course of public showing of his movies, and understand his heart and passion for what began in this genre over two decades ago with the young David and others in this now established field of Christian film. Fasting forward to White's powerful alliance with Michael Scott, Russell Wolfe and Elizabeth Travis, David formed PURE FLIX (2005) which took the message of the Gospel, Christianity and the Bible to various action movies like Jerusalem Countdown; The Mark 1 and 2; Sarah's Choice with Rebecca St. James and so many more, one will have to go to their website (here) to get the full list. Some of my absolute favorites, for which I purchased several licenses over the years to show at church were The Book of Daniel; Woodlawn; Do You Believe and what several of us consider the best movie on Evangelism we have seen - Encounter with Bruce Marchiano! Of course, what really blew Pure Flix, the Whites and Kevin "Hercules" Sorbo into the stratosphere was God's Not Dead (GND)1! The award winning GND 1 was the highest grossing indie movie of 2014. It has not stopped as the world keeps giving storylines with God's Not Dead 3 due in the near future. However, while most people associate David A.R. 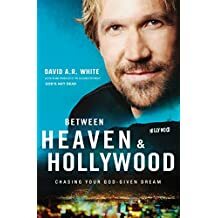 White with Pure Flix and Christian movies, they may not be too aware of his first book - "BETWEEN HEAVEN AND HOLLYWOOD....Chasing Your God-given Dream" (2016). 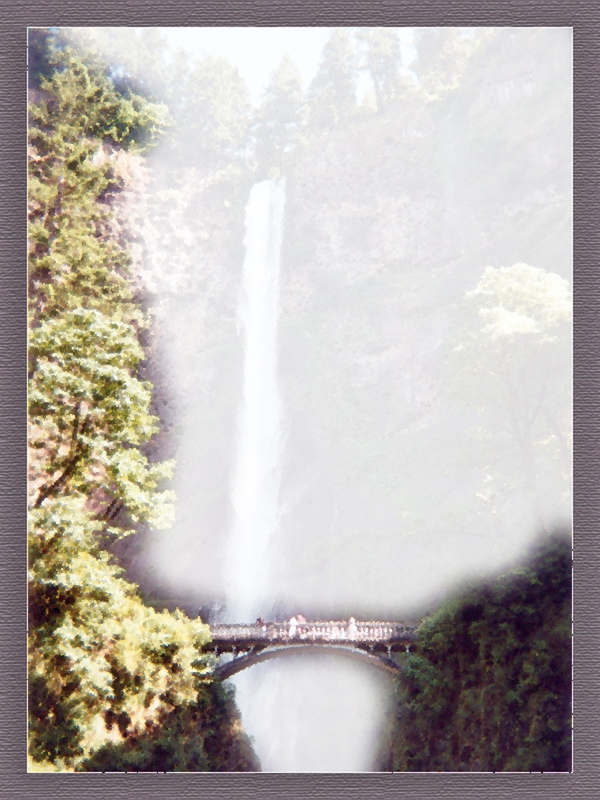 Click here to read the First Chapter and here for purchasing opportunities. Any successful person will tell you, there is no such thing as an "overnight success". What can happen though, is a Christian who is faithful in the hard things, the seemingly small but important things and who completely follows the God Who will break things open in His Timing. 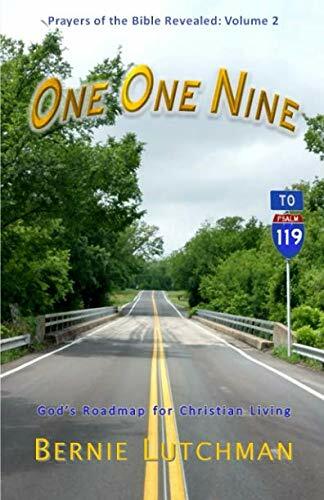 I read the book and enjoyed the funny narrative of this young man from a conservative Mennonite background, who never took his eyes off why God put him here. I heard him describe the book for a full interview on Chris Fabry's Moody Bible Radio show and it became obvious why he wrote it - to encourage somebody else to follow their calling God has put in their hearts. White says on his website "there is no one too common, too uneducated, too poor, too inexperienced, or too broken that he or she cannot be used by God". This is reason enough to get his book. The family that writes together, makes a whole of impact together! Andrea Logan White is David's beloved wife and from the state of Illinois. 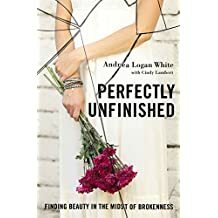 Her book was released less than two months ago (Sept. 2017) and is a stunning work called "PERFECTLY UNFINISHED: Finding Beauty in the Midst of Brokenness"
Two things I gleaned from reading Andrea's book. The first one is do not start it unless you intended to finish reading the entire book, because it is not what you think. The second thing is, once you have decided to read it, you cannot put it down. It will stun you, make you scratch your head and then you get to the incident where God reveals Himself to the hurting and lost Andrea, your concern turns to rejoicing as another soul is added to the Rolls of Heaven. I was not planning to write a full article like this on this, the REAL (reel?) Power Couple of Hollywood and both their books, until I could not put down the second half of Andrea's book, in spite of an busy early morning coming up. All I had planned on doing was to leave reviews on Amazon.com, where I got both David's and Andrea's books. But completing Andrea's books in one sitting opened my mind to this article. It is, as Rich Christiano's movie is called - "A Matter of Faith"
1. Praise God in the Storm. This is not just a Casting Crowns Song. It is the foundation of a lasting Faith. 2. Love God in the choppy seas of doubt, pain and suffering. 3. Obey God even if you think you have nothing left to give...because you do (have something left to give - YOU). 4. Say NO to temptation to shake your fist at God. Job's wife told Job to "curse God and die". Job refused because He knew the Character of God and that His Redeemer liveth. 5. Trust, follow and BELIEVE God in Christ, no matter the depression, doubt and despair. Trust Him completely, even there seems no earthly hope. Trust Him because Hope in God IS out of this world. The portion of the book which describes Andrea's Walk with Christ as a wife and mother could describe the hidden trials and tribulations of many in today's high-stressed world. What was incredible to me was the previously unheard-of level of pain (physical and other) which one human can endure. I minister in men's ministry (for over 20 years); senior homes for about 14 years; street ministry etc. for over a decade, and have never come across such a warm, heart-felt, completely heart-breaking yet uplifting series of pages as I read in PERFECTLY UNFINISHED. As I read about the Faith behind Andrea's pain, which led to her present perseverance, my mind immediately shifted to the words of the great Joni Eareckson Tada (a quadraplegic) who had this to say about living in constant physical pain and a horrid diagnosis. Joni said the following during an interview with Christianity Today (in part): "Even though it seems like a lot is being piled on, I keep thinking about 1 Peter 2:21: 'To these hardships you were called because Christ suffered for you, leaving you an example that you should follow in his steps.' Those steps most often lead Christians not to miraculous, divine interventions but directly into the fellowship of suffering". Andrea Logan-White is not without her own movie portfolio! She was one of the leads in the hilarious "MOM's NIGHT OUT" and is currently in a weekly comedy series with her husband and several others, on the increasingly popular PURE FLIX Streaming service called "HITTING THE BREAKS". PERFECTLY UNFINISHED is available here on Amazon.com. 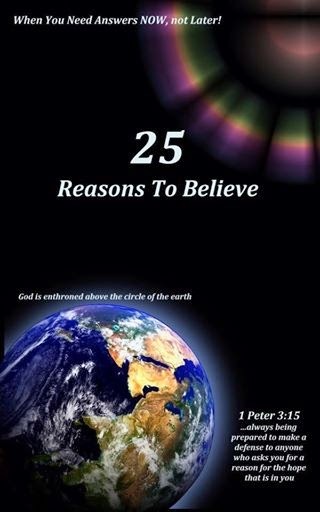 FREE EBOOK DOWNLOAD NOW - WHY CHRISTIANITY, 25 REASONS TO BELIEVE! 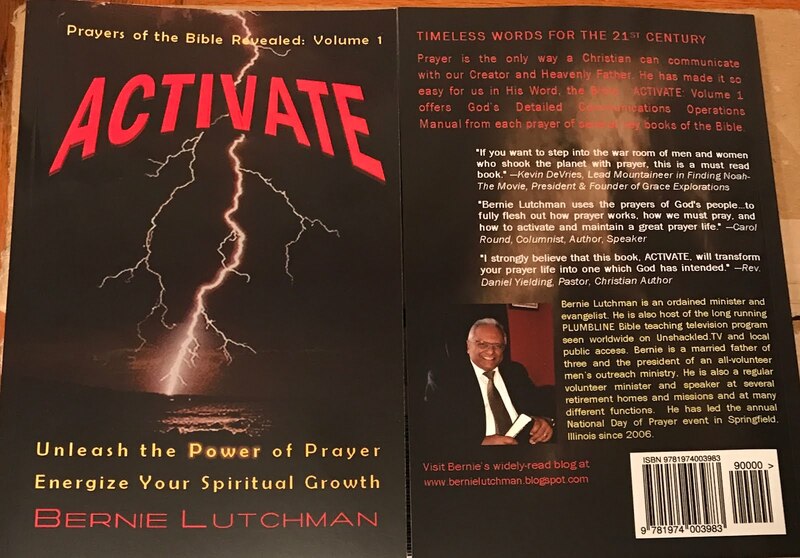 Written by Bernie Lutchman, John Snyder, Pastor Mike Henderson Springfield FBC. CLICK HERE FOR LIFE COACHING WITH A PURPOSE! VICKI'S TRIBUTE TO THE TROOPS "Home for Christmas"
GOD BLESS AMERICA AND HIS PEOPLE! WHY NOT FAMILY DAY IN AMERICA?! LESSONS FROM PAUL'S SPORTS ANALOGIES! PSALM 103 VERSE 3 - "TO HEAL AND FORGIVE"
THE 3:16 VERSES OF THE BIBLE: PART 24: "STRONG HANDS HOLDING ON"
Any book written by Dr. John MacArthur!! Any book written by Jim Cymbala! Want to be an Effective Servant of the Lord? This book is for you - young, old, men, women, teens....WE CAN ALL LIVE IN VICTORY!! BUSINESS MEN IN CHRIST 1955 ALF FIRE ENGINE!!! 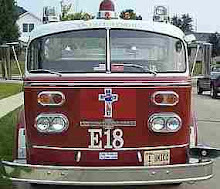 "ON FIRE FOR CHRIST" is our motto here on our Fire Engine, which we use many times annually, in Parades. It is our hook to spread the Gospel through a Massive Tract Ministry!! National Anthem at Busch Stadium! Seen in background with bowtie, Percussionist Bernie Lutchman. Karen Deal, Illinois Symphony Maestra, leads at the 2006 Christmas concert in Springfield, Il. Sam's 1st Place Sculpture: "Pirates of the Clay-ribbean"! Sam's 1st Place Painting: "Strolling on the Water"
MINISTRY, BLOG SITES & MORE! CLICK HERE TO KNOW MORE ABOUT JESUS!!! Dr. Al Mohler, Pres. Southern Baptist Theo. Sem. DR. HENRY BLACKABY FRESH ENCOUNTER CONFERENCE 2009 IN ATLANTA, GA! In His Grip Golf Ministry! International House of Prayer, Springfield, Il. NATURAL HEALTH PRODUCTS FOR A HAPPY LONG LIFE!! Pastor Terry Delaney, So. Baptist Theo Seminary, Louisville, Ky.
WTLC WEB RADIO!! from Springfield,Il. Any Worship Music by Robin Mark of Belfast, Northern Ireland!! Classic Hymns of the Faith - ALL!! Pastor Ross Parsley of New Life Church, Colorado Springs, CO.
Television shows or videos (any) with Dennis Swanberg aka The Swan!! THE LUTCHMAN FAMILY SINGER KIDS! "How Great is Our God!" Power of a Praying husband and wife!